Winnipeg – September 27, 2013 – The UFCW Local 832 bargaining committee representing more than 3,000 Superstore and Extra Foods members in Manitoba, shook hands on a on a tentative deal with Loblaw officials yesterday at 4 p.m.
With the union’s leverage of a 98.3 percent strike vote, both sides worked around-the-clock on a new deal that will avoid a province wide strike. 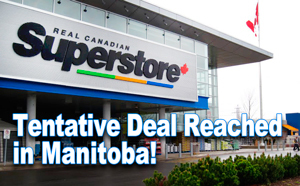 Details of the new deal will be released to the members at seven locations across Manitoba on October 20, 2013. For the full story and video, please visit Manitoba’s largest private-sector union and leading voice for retail workers, UFCW 832.